Great .. only 25% of the browsers have an issue ;-) I'll try to find the issue. If you have additional input (MSIE versions affected, any error messages, a fix :-) I'd be interested in that. I'll first have to bring up a windows system here, so I can test on MSIE myself. The user that first reported the issue was showing as using IE 7. I then logged in using IE 8 and while the Search Location worked for me and I was able to Save my Changes, the community map is still not working for me either. I will see if anything is showing in the event logging. Event Logging only displays information when I have it show "Debug" stuff (which logs things at ridiculous rates by the way, several dozen things per minute). And about 20 or more in addition to these. The event logs that you show here are not related to the Google Maps module. You might want to look into templates/jwtalk2/settings.tpl though, just to get the logs down for yourself. Check out /forum/cache/tpl-jwtalk2-settings-d9c3e476463f713008d432dea71c47e2.php-stage2. On line 101 in that file, some undefined index is used. This can be related to a statement in your settings.tpl file. Also, notice that there are links below the map, kinda displayed like a mess. But when you mouse over them, they disappear one by one. Looking at that link above in Firefox however works just fine. The links are from the jumpmenu module, so I suspect the issue might have something to do with that module. I just found some time to experiment a bit and I found that users not being able to search for a location could be because they enter a string and then hit <enter>, instead of clicking the search button. I accidentally replaced the type="submit" button with type="button" in the location editor. Please try if clicking the search button does make the search work for you. If yes, then that problem can be fixed with the new version of the module that I'll upload in a minute. I have to leave now, but when I get back home later today, I'll investigate the issue further. I am not using jumpmenu, just to let you know. Yes, when I type my location and press my enter key, nothing happens. 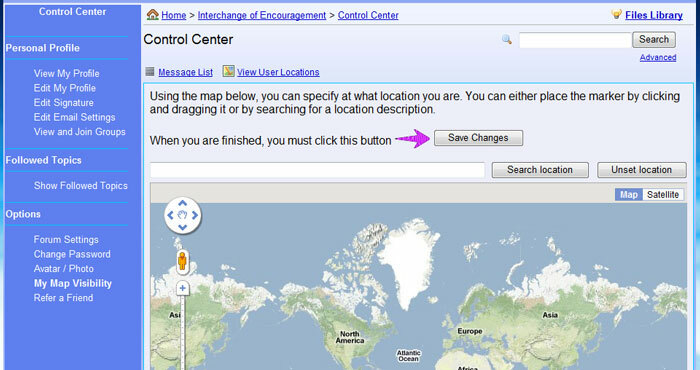 But if I click the Search Location button with my mouse pointer, it does mark the map with my location. Viewing the community map still shows nothing though, either on my site, or here on phorum.org's map at the link I posted above. If yes, then that problem can be fixed with the new version of the module that I'll upload in a minute. I just upgraded and it did not work. Pressing Enter still submits the form and 'updates your profile' instead of submits the location to the Search Location button. Could it be a conflict with having 2 type="submit" buttons on the page in the form? At any rate, the plot point issue is of more significance. I can always add a statement to this panel telling the user to use their mouse pointer and not their enter key. I have a display issue in MSIE as well with the map not stretching across the screen. And then if you notice, I changed the individual marker image. But I had to overwrite the one that comes with the package. Is there a way to make this image point to a file in my custom template directory, so that it is not overwritten when I upgrade the module package? As for the stretching: did you update the usermap.tpl according to the new mods/google_maps/templates/emerald/usermap.tpl? All maps must be contained in a surrounding div now. The surrounding div determines the size of the map that is shown. Does the usermap on phorum.org look good to you? (ignore the links at the bottom; those are from the jumpmenu and I still have to figure out what causes those to fail) --> usermap When I open this usermap in MSIE9, then things look okay to me. You can hack this code to make the ploticon point to an image in your own template directory. For a clean way to override the image, I'll have to do some more work on the code. I'll add it to my TODO list for the mod. Edit: I just uploaded a new package, in which I added some new code for the location editor. This change should make the location form work correctly. Both pressing <enter> and clicking the search button should now trigger a location search, without submitting the form. I upgraded the module on phorum.org, so you can also test it within the control center here. Edited 1 time(s). Last edit at 04/17/2011 08:09PM by Maurice Makaay.